"Back to School" Eats Series. Breakfast Wrap-Up. Here it is! The "Back to School" breakfast round-up to last you until finals...or the pre-school graduation ceremony. 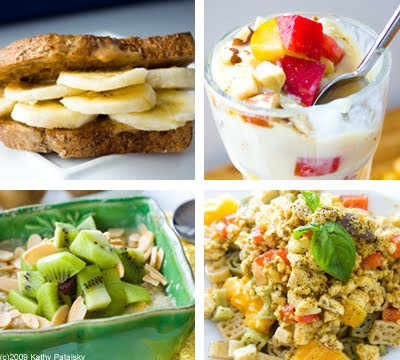 You see, these breakfast recipes are for everyone, but students and parents will especially appreciate them. 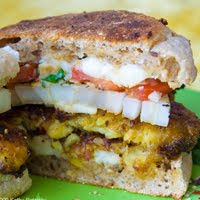 This grab-n-go recipe has a lesson hidden beneath its toasted layers: there is no excuse to skip breakfast! Got it? Now check out these Toast-Ups! 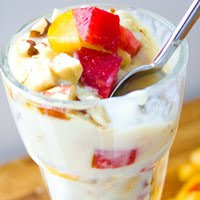 Here's a 'plumb' perfect summer fruit parfait that even Mark Twain would adore. Crunchy raw Brazil nuts, vanilla soy yogurt and sweet tart plums and pluots. It's my answer to granola fatigue: a granola-free parfait! And find out why I call this my 'Tom Sawyer' parfait. 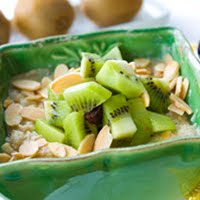 Mom, there's kiwis in my oatmeal!!! Tofu scramble and pasta??? 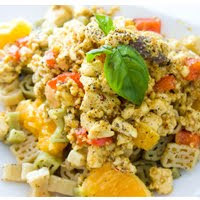 It may seem a bit odd, but the flavors of sweet soy cream, fresh oranges, pasta and tofu scramble are a perfect way to start a brain-power-needed kind of day. Protein, complex carbohydrates and all the sweet orange juice flavor you crave to wake you up and send you to the head of your class. All great things start with simplicity. And it doesn't get any simpler than this! 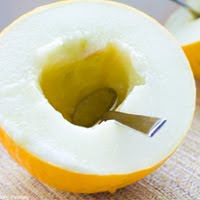 Just grab a spoon...melon bowl bliss. 6) Tiki Squares. 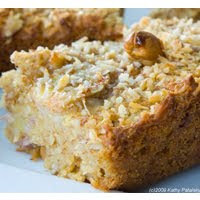 Oatmeal Bake. Bake it once, it will last you all week long. Coconut, cashew and banana tropical flavors make something as simple as oatmeal into something exciting! And it's even portable, you can't say that about oatmeal in a bowl. My go-to breakfast is a smoothie. 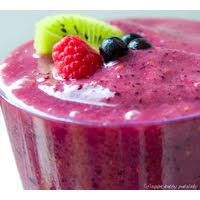 So here are a few ideas to get your blender spinning!